Toll-free phone numbers for your Shopify Store. Protect your privacy and improve communications with your customers. Switchboard provides you with a phone number (toll-free or regular) that you can safely put on your store's website. 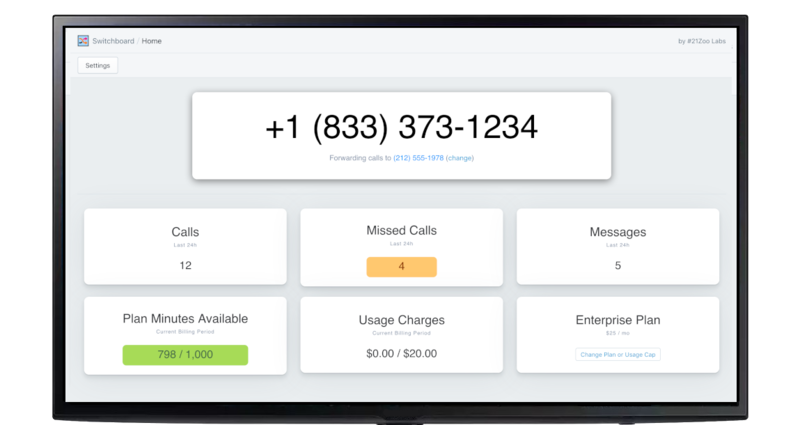 Customers call the switchboard number and the call will be routed to your personal phone number, you don't have to worry about exposing your personal contact information on the internet. Our Schedule feature lets you decide what hours you want to be available and when calls and texts should go to voicemail. Your store is open 24/7 but that doesn't mean that your sleep should be interrupted by calls in the middle of the night. Give your store a professional look and feel by adding a toll-free phone number to contact you. You can field product inquiries and make sure that your customers know you're a real store, run by real people. * See here for a detailed list of all countries and rates. We currently support calling and texing numbers in the US only but are working on international support. Contact us at [email protected] if you're interested in using international features, we'd like to hear from you! Billing is handled by Shopify. Can I try the app before I choose a plan? Yes! All plans come with a 5 day free trial so you can test before being charged. Yes! You can upgrade your plan later or uninstall the app if you don't use it any longer. The app only needs access to your basic store information so you can connect via Shopify. As soon as you uninstall the app, we delete all data related to your store. Are you adding more features? Yes! The app is under active development and we roll out new features and metrics regularly. Subscribe to the email newsletter to be kept up to date about new developments.